Last December, a Yorkshire terrier named Sushi ran away from her Houston home and popped up not in a “Missing Dog” sign, but rather for sale online. Sushi’s not alone—the pup’s part of a wave of pets that have been kidnapped and resold on Craigslist and other sites, either back to their owners or others. It’s like Taken but with Fido and it’s pretty perverse. 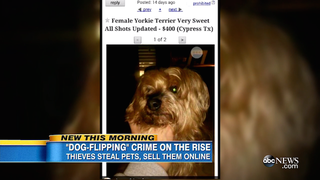 According to the Daily News, this type of pet kidnapping and extortion is called “dog flipping,” where pooches are stolen from their owners, or found after they’ve run away like Sushi, and sold online to the highest bidder. “Dog flipping is a horrible experience for the dog. It rips them away from their loving family and they end up with a stranger,” American Kennel Club Reunite CEO Tom Sharp said in a statement to the Daily News. I can hear the heart of Tia from Pitbulls and Parolees breaking. To be safe, the AKC says pet owners should not share how much their pet cost with strangers and get their animals fitted with a microchip because people are crazy. For Sushi, he was reunited with his owner Kara Lowe after her friend found him listed on Craiglist for $250.